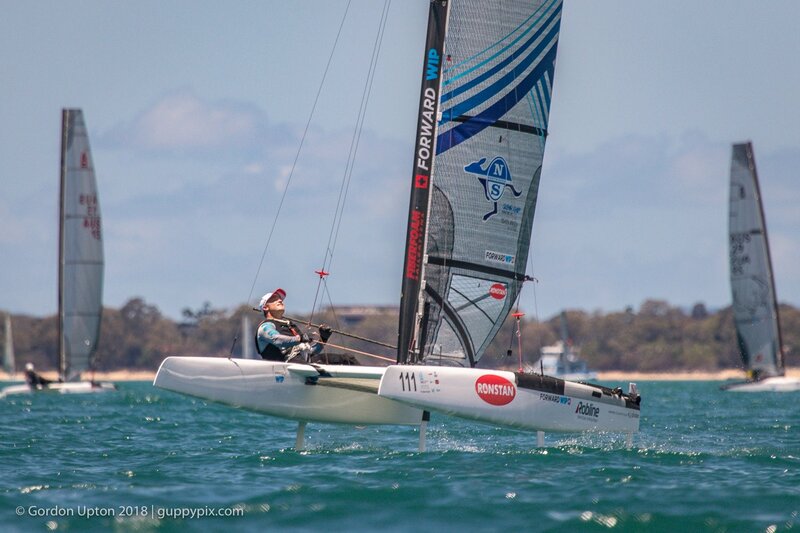 Now the Australian Nationals has finished with sweeping victories both Glenn Ashby and Andrew Landenberger on their respective versions of the Exploder Ad3, we can reflect on what happened in the last week, and look forward to the Worlds next week in Hervey Bay. The final day of the Nats started in pretty light Easterly 8 kt winds, and flat waters. During the day, it increased to 12 or so kts and was forecast to be backing to a Northerly later. The two fleets made their way out to their race areas for the 11am start, and the Race Officers got them away in good order after slight delays for mark laying, as they tried to chase a still settling wind. On the Classic course, the pattern of the previous days quickly established itself at the front with Landy (AUS 308) leading Scott Anderson (AUS 31) and pulling away from rest of the fleet. Graeme Parker (AUS 967), Alberto Farnassi (SWE 59) and Ben Hall (USA 99) led the following pack. But Landy’s speed meant that he was never in any danger, increasing his separation on each successive lap, leaving the other places to be fought over. During the last race, there was a massive wind shift of almost 90 deg left. This wrong-footed some of the fleet, but brought huge bonus gains to others. Landy’s son, Andy (AUS 300) decided that he could sail better than on previous days, and put in a good 6th, 5thin the second race. He would have got a 4thin the second race too had he not been pipped by the ‘Big Swede’ near the line. This seemed to phase him somewhat, but Landy and Scott noticed, so Scotty sailed over after the race and was seen to be giving him some sagely advice from a Jedi Master. It must have worked, as the lad got a 4thin the last race. In the last race Landy experimented with a port start, having the championship in the bag, so had nothing to loose. He worked his way ducking through the fleet, and still got to the top mark first proving his new Classic Ad3 setup was pretty much spot on. He won the Championship with 7 bullets. Over at the Open Foiling course, a similar pattern formed with Glenn (AUS 111) leading and all the others following. On this course, the wind look a little higher for the foilers, so most were able to get plenty of air-time. The wave pattern was less than the previous day, making it a much pleasanter experience for all. Behind Superman, the battle for the other podium places saw Glenn’s ETNZ team-mate and man voted ‘World’s coolest helm under pressure’ Peter Burling (AUS 7) clinched second from a resurgent Mischa Heemskerk (NED 7). Just behind him was Darren Bundock (AUS 88) who just held off Steve Brayshaw (AUS 25) and the reigning World Champ Stevie Brewin (AUS 4), who looked to be struggling for pace in the waters of Hervey Bay. 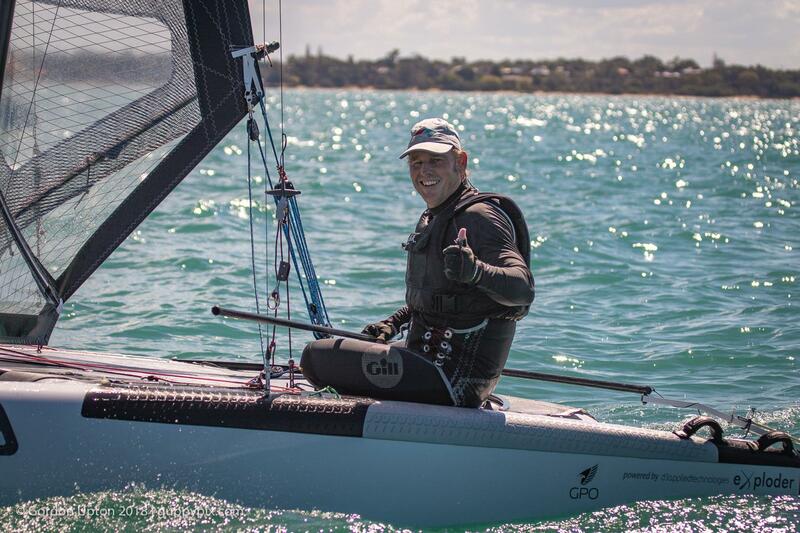 Glenn won the Championship with an emphatic 6 bullets in the 7 races sailed. Only a mast rotation line problem caused him to drop to a 5thin Race 3. The original Race 2 the previous day was cancelled after the finish. The reason being that after a shorten course instruction was given quickly by the PRO for safety reasons. However, it failed due to a misbehaving anchor winch in 25+ Kt winds, and the inability to get the finish mark boat in place in time resulted in many sailors doing an extra lap. The subsequent confusion over lap numbers resulted and it was finally elected to bin the whole affair. Best laid plans and all that! So, what have we learned from the event, generally considered a good warm up for the Worlds? The Hervey Bay waters are warm, but relatively shallow. This can result in a rather lumpy sea state when the winds get up, similar though, to Sopot, but with turtles. The winds are generally smooth though. That the beaches are to die for, goes without saying and the organization, and the way everyone has been treated, has been superb. It seems that in both fleets, we have sailors who are totally dominating their fleets due to a combination boat setup, pace and supreme boat handling skills and a nice dose of luck, something which can never be overlooked: Napoleon when being recommended a new General always asked if he was lucky. In the Classic fleet, Landy, sailing a new Classic version of the popular Exploder Ad3, looks uncatchable. Barring accidents, he is a good cert to be the first Classic World Champion come the end of next week. 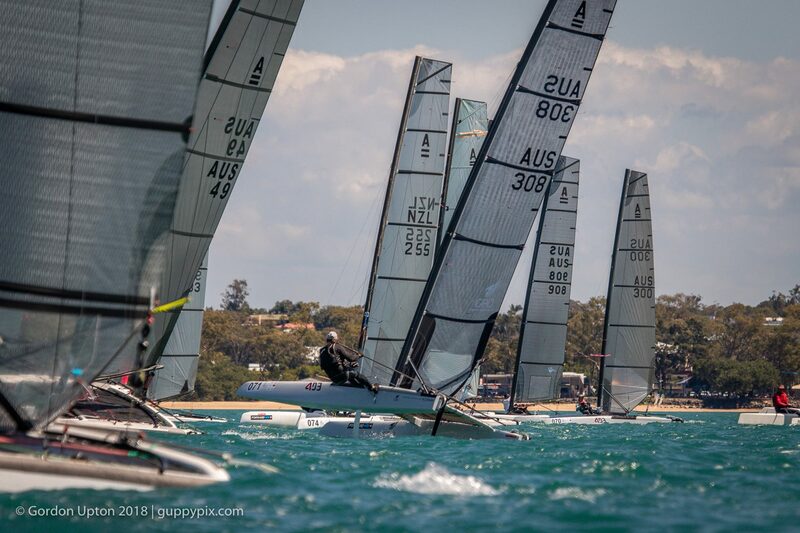 On the Foiler course, it is difficult to come to terms with what is on show again. Glenn seems to be so far ahead of such supremely talented field this year, that it defies logic. Looking from the bottom gate up to the first top mark after the leaders have rounded, you will see a line of boats silhouetted on the horizon. The remarkable thing is that this line, when looking from the mark, at the right of your view, and running your gaze left to the leading boat, you will see an ever-increasing gap emerging between them. The gaps between the boats seem to double as you look along the line towards the leader. This gap increases with each subsequent leg meaning that by the finish, Glenn can be a clear 5 mins or more ahead of the second placed boat. And that second boat could well be sailed by an America’s Cup sailor, we are not talking local pond sailing aces here! What is this man Ashby doing that is so different to what all the rest are doing?? Yes, we know he has boatspeed in shed-loads. 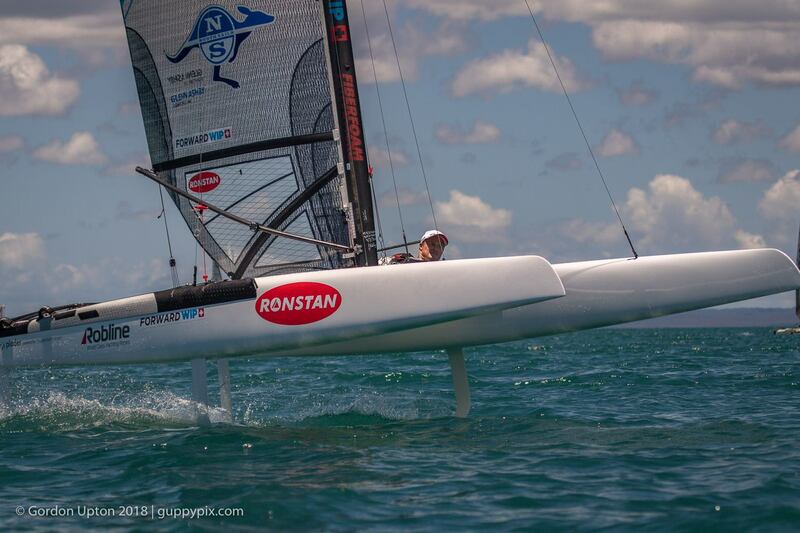 He can get foiling earlier and in lighter winds, possibly because of his lighter stature, but again, others can do this. His tactical skill is accepted, but there are probably other more skilled tacticians out there in that fleet. So there has to be something else at work here that no other sailor has yet figured out. He seems to be able to read and become at one with his boat, maybe in a manner that he can’t actually define himself. Some sort of Zen way maybe? A thing he does because he feels something inside, maybe for him, it ‘just happens’. There are a few racing sports where one individual has dominated their field. Michael Schumacher and Valentino Rossi spring to mind, but they’d have had to have won twice more of course. Again, luck plays a part. He is acknowledged as being ‘Lucky’. If anyone runs over a huge Manta Ray and gets their foils ripped off, you can bet it’s not going to be our boy Glenn. So, I think we can assume you’ll not be getting good odds on him again this year. It all kicks off again on Sunday with the big one, so stay tuned race fans.